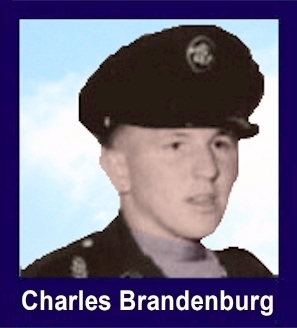 The 35th Infantry Regiment Association salutes our fallen brother, PFC Charles Frank Brandenburg, who died in the service of his country on August 5th, 1967 in Quang Ngai Province, Vietnam. The cause of death was listed as Booby-Trapped Grenade. At the time of his death Charles was 20 years of age. He was from Frederick, Maryland. Charles is honored on the Vietnam Veterans Memorial at Panel 24E, Line 79. The decorations earned by PFC Charles Frank Brandenburg include: the Combat Infantryman Badge, the Bronze Star with V, the Purple Heart, the National Defense Service Medal, the Vietnam Service Medal, the Vietnam Campaign Medal and the Vietnam Cross of Gallantry with Palm Unit Citation. Charles is buried in Mt. Olivet Cemetery in Frederick, MD. Frederick is located about 50 miles north of Washington D.C. on I-70. The cemetery is located on the south side of Frederick near the intersection of I-70 and I-270. The cemetery office address is 515 S. Market Street. On patrol 2 KM N-NE of Mo Duc. Frankie, I remember that sad day, our family received word of your death. Johnny, wasnt back, from Vietnam long and was so upset when he heard. He was, so worried about Sandy. I remember, as a kid, you used to ride by the house on Friday evening, going to town and blow the horn. You and Johnny, are side by side, together, on our local war memorial, forever etched in stone. Strange, how cousins, can be killed in that order. You both paid, the high price with death. Rest in Peace, my dear cousin. I check your grave, with each visit, to make sure you have a flag when I visit, Johnnys grave.